THE MARTIAN is exactly the sort of film American movie-goers needed to see after another week with a mass shooting. It confirms that yes, we are a decent group of people who would take the fate of one lost astronaut seriously. Although I doubt there was more than a handful of viewers that could follow most of the science dished out in the film, we all understood its heart and humor. NASA’s involvement in the production insured that scientific mistakes were few. It felt well told because of this. 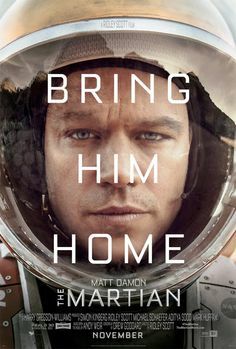 Mark Watney is a botanist left behind on Mars when a ferocious storm kicks up and his fellow astronauts take off. His colleagues believe him dead as does NASA back in the U.S. But as his fellow astronauts are hurtling further away from Mars, someone at NASA spots movement. And thus begins the joint project of rescuing Mark. There have been other movies about people marooned. Most of them deal with loneliness as a major component. This one instead relies on the resourcefulness and knowledge of scientists to provide a plot. Both Watney, his colleagues in space, and the ones on earth, all do their part in his rescue. Well-acted, well-directed, and well-made, it feels a little long at well over two hours. And it had one scene too many. But most audiences will exit the theater humming the seventies disco songs that seem much better now than then, and feeling a bit brighter about life on earth. Another movie I wasn’t sure if I would like. I don’t like overly long movies, but 70s disco music might help.